DUE TO CONCERNS ABOUT AIR QUALITY THIS EVENT HAS BEEN CANCELLED AND WILL BE RESCHEDULED. Join us for a Unity Walk in celebration of Bay Area Stands United Against Hate Week. We will first meet at the Library at 6 pm for some words of inspiration from guest speakers. Then we will walk from the Library down Norbridge Avenue, Redwood Road, Castro Valley Boulevard, Santa Maria, and then back down Norbridge to the Library. 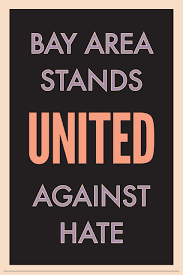 We will have Castro Valley Stands United Against Hate Posters available, but please feel free to bring your own signs. This is event is sponsored by the Castro Valley Community Alliance.